Roope Maaranta (left), Petra Poimaa and Alarik Rantala from Haukilahti Upper Secondary School are exploring the new premises. 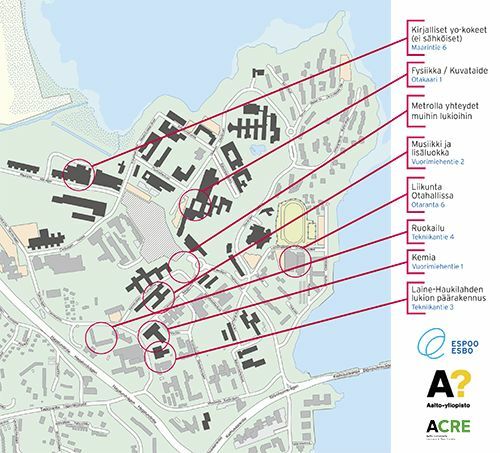 The concept of a conventional learning environment will be revolutionised when the students of Haukilahti Upper Secondary School start their studies on decentralised premises on the Aalto University campus in Otaniemi. The solution supports new ways of learning, increases the joy of learning and opens the school doors to joint operations and networking. It makes for more efficient use of space when the facilities are flexible and the rest of the environment is utilised in teaching. The pilot project, which has also attracted international interest, involves a meeting place for the whole school in a recognisable central building on Tekniikantie that used to host wood technology classes. Its facilities are adaptable and the users can modify them to meet their needs. The students can also utilise the facilities and other resources of several other university buildings in interaction with the university students and faculty. The students of the upper secondary school will use the premises of the university’s departments of Applied Physics, Chemistry and Art as well as the sports facilities in Otahalli. Companies have also been invited to help develop innovative solutions to promote learning. In the future, the facilities of Haukilahti Upper Secondary School will be situated along the metro corridor. When there are several upper secondary schools along the metro line, it is easy to move between the schools and organise more joint course selections. The solution is based on an operating model developed jointly by Aalto University and the City of Espoo, which sees school as a service that supports learning comprehensively – not just a school building. The starting point of the pilot project is a new kind of organisation of education, in which learning takes place everywhere and at all times, in interaction with others. The conditions for learning are designed on the terms of learning. Digitalisation enables a new kind of learning and strengthens the community spirit. Another aim is to encourage actors to work together and develop themselves so that everyone can feel like a part of the learning community. “Aalto University wants to build an innovative society and educate people who can change things. We expect new expertize and new kind of learning to be born from the close interaction between Haukilahti Upper Secondary School and Aalto University. We welcome the students and personnel at the Haukilahti Upper Secondary School to work and learn with us”, says President Tuula Teeri of Aalto University. “The move to the Aalto University campus will enable Haukilahti Upper Secondary School to rise to the challenges of the new curriculum in a fantastic way. The inspiring learning environment and close cooperation with Aalto University will strongly support learning. Our students will be able to use the university’s Language Centre, for example. This is a brand new way to complete upper secondary school,” says Head Master Pekka Piri of Haukilahti Upper Secondary School. It will also make for a smoother education path from upper secondary school to higher education when the students have the opportunity to familiarise themselves with university studies and the academic world. “The students have been strongly involved in building the upper secondary school campus. One of the upper secondary school’s tutors commented that ‘this is a cool project that gives a huge amount of motivation for studies,’” says Piri. Another purpose of the pilot project is to test flexible and cost-effective operating models that can later be expanded and scaled up to cover other educational institutes and services of the Education and Cultural Services. The experiences and ideas gained can be used, for example, in situations where schools need to temporarily move to other premises. At first, 350 students of Haukilahti Upper Secondary School will study in Otaniemi. Lessons will be organised in Otaniemi until the renovation and extension of the premises in Haukilahti are completed. They have been allocated for 2018–2020 in the city’s investment programme. Later on, the number of students on the Otaniemi premises may increase to 700. The pilot project will be executed in close cooperation with Aalto University and other parties. Plans are being made for the establishment of a special developer community for partners.